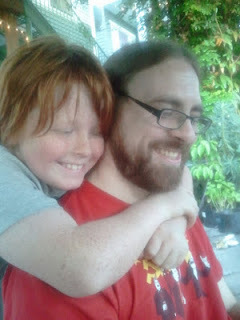 Pictured is my fiancé and his son from July 4, 2011. We were hanging out with friends, barbecuing, playing card and board games and making homemade ice cream before heading out to see the fireworks. My fiancé called over to his son, "hey, Tristan! Come over here!" My fiancé had gotten his first smart phone with a front facing camera. They proceeded to take a series of goofy looking pictures. While this revelry was occurring I took out my camera and started taking pictures of them. This is one of my most treasured pictures of them. What it captured was their happiness of being together. My fiancé's son lives 2,300 miles from him. During the Summer months, he lives with us for 8 weeks. For 44 weeks out of the year, they are in a long distance relationship. When this kid is reunited with his dad, his face lights up. When this dad is reunited with his son, his face lights up. We are constantly counting down the days until these two are brought together, in person, once more. This post was written as part of the Weekly Challenge: Truth is Stranger than Fiction by The Daily Post. The challenge was to capture someone looking truly happy, but not “I’m-smiling-for-this-photo” happy. Do you have a photo that meets this criteria? What a sweet story, and even better pictures. I am sure both pictures are treasured for different, and yet the same, reasons. Distance makes the heart grow fonder, right? Thanks for sharing and here's to the next eighty days or so until the next summer visit. Long distance relationships of any kind are so difficult but more so for the parent-child.. Here's hoping the countdown is swift and maybe soon they can visit during the year as well..
What a sweet photo and story. Tristan is a blessed boy to have you and your fiancee who care about him so much! Have a great weekend!! This post is a reminder to me that posts don't need to be long to pack a punch. I love how much you were able to share of their love for each other in your carefully chosen words and 2 wonderful photos. (Excited for you and your new camsy.) Long distance relationships are hard - - that's the bottom line. But how wonderful that when they ARE together, they're loving on each other in ways like this. Soaking it up and filling up the well to last them until the next visit. That's making lemonade. Such a sweet and beautiful post! Thank you! We are definitely counting down the days. We always get excited this time of the year because we are purchasing tickets and starting to make plans. Definitely. It was a very hard decision for my fiance to move away. My fiance is in a much better place though to be a good father. They both work very hard to make sure they maintain contact with each other through out the year. Technology advances are wonderful for this sort of thing. They video chat, watch movies and play video games with each other. All 2,300 miles apart. It still is really hard on them and their time together is precious. We are planning on visiting him this Christmas. We would also like to have him come see us for spring break sometime. Thank you! I really hesitated posted this. When I read the challenge, I knew this picture was perfect for it. It's such a personal post though. Long distance relationships are hard. Our time with Tristan is precious to us. I'm excited for my camera too! I can't wait to take a billion pictures of him. He's going to hate it! Haha! Me too! I love this picture of them so much. 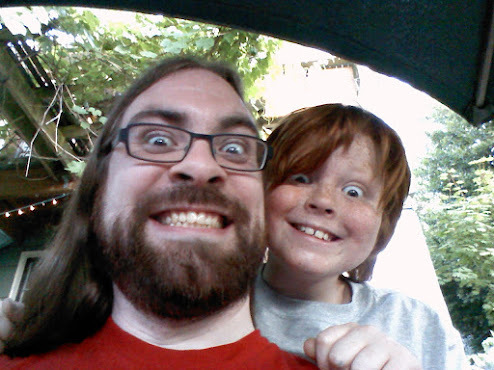 I totally forgot what they were doing until I looked at my Google+ album looking for this picture. I found that silly picture of them and remembered what they were doing.